A radical multimedia capable phone with a huge touch-sensitive display, the Nokia 7710 is a massively powerful handset that's like nothing else on the market. 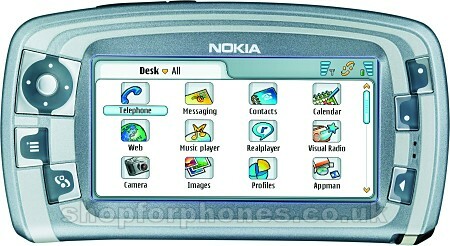 The most noticeable feature of the Nokia 7710 is the large display, coming in at 640x320 pixels in 65,000 colours. This makes web browsing and other applications very easy to use and allows for large-screen multimedia playback. The display is stylus drive, making it a simple but powerful device to use. On the back of the Nokia 7710 is a one megapixel camera, and the handset comes with a whopping 90Mb of internal memory, plus 128Mb supplied on an additional MMC card, expandable up to an enormous 512Mb. This is a Bluetooth capable phone, so the 7710 can be easily used with a range of Bluetooth accessories or can be connected up to a PC. The 7710 also comes with a FM radio, "Visual Radio" over the inbuilt GPRS network, has a Flash compatible XHTML web browser, email client plus some compatibility with Microsoft Office documents, MP3 and multimedia playback, RealPlayer and a whole stack of PIM functions. The Nokia 7710 is fairly hefty at 189 grams and 128x70x19mm but it packs an awful lot of features in. Talktime is around 4 hours with 7 days standby. Available now SIM free for worldwide delivery, later on UK contract. Please subscribe to our newsletter for updates. If you want more information on theNokia 7710, subscribe to our mailing list. Also, the Update newsletter contains general news about new phone releases.